Foods for weight loss are necessary for your weight loss journey. You do not only need to exercise in order loss weight, what you eat has an impact on it too. If your objective is to lose weight and keep it off; it is, therefore, important to pay attention to the type and also the quantity of food you put into your body. Below are the 40 best foods for weight loss. These are a great superfood for weight loss. They are essential for suppressing appetite and cravings. They have plenty of fiber which when eaten can keep you fuller for longer hence you will not feel the urge to snack often. The high fiber contents help slow down digestion and the release of insulin in the blood which helps to lower blood sugar. 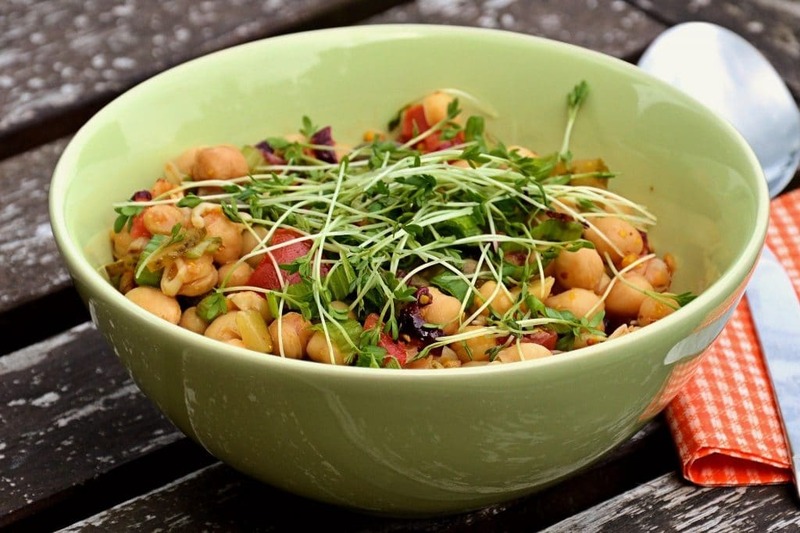 Chickpeas have high amounts of protein which helps to speed up metabolism. This weight loss food is full of antioxidants, minerals, and vitamins. They have fewer calories which makes them friendly for weight loss. Mushrooms can increase a feeling of satiety and keep you full for a long time. These beans like other types are a good source of proteins. They have high amounts of both soluble fiber but are very low in fat — high fiber aids in reducing cholesterol and keeping your blood sugar stable. Adding them to your diet helps reduce the risk of chronic diseases such as diabetes, heart disease and they also aid in weight loss. Add them to your salads, soups, and sauces to improve your overall health and shade those extra pounds. This superb vegetable belongs to the cruciferous family of plants. It has many health benefits. Broccoli is low in calories and sugar. It also produces a feeling of satiating which can prevent overeating. Include it in your diet if you want to reduce weight. Broccoli is rich in protein, calcium, vitamins A (beta-carotene) and C, potassium but has low amounts of sodium. It is an excellent anti-carcinogenic vegetable due to its abundant phytochemicals. Brocolli has high amounts of dietary fiber which can speed up digestion and also help lower bad cholesterol. These are among the best foods for weight loss due to their water-rich content which helps hydrate the body. Their water content can aid in weight loss and also facilitates the elimination of wastes from the body. Cucumbers are full of dietary fiber but have fewer calories and fat. You can eat plenty without adding extra calories which can add weight. Eat cucumbers with their skin on to get the most benefits. Most people argue that avocados are full of fat and can contribute to weight gain. On the contrary, this is not true. A study done in 2017 discovered that including avocados in your weight loss diet plan can aid in weight loss. Avocados have a balanced composition of fatty acids and high amounts of dietary fiber which helps to reduce the levels of fat in the blood. Their unique fatty acid composition makes them an essential diet in hypertensive, diabetes and coronary heart disease patients. Eating them reduces the desire to eat more due to their satiating ability. This superfood whole grain is gluten-free hence an excellent substitute for wheat. Buckwheat is an excellent source of proteins and minerals such as iron and manganese. It has fewer calories compared to wheat. They are low in fat but have high amounts of dietary fiber which make then essential for weight loss. Including them in your diet helps to enhance proper digestion and make you feel fuller for longer. Buckwheat’s ability to suppress appetite makes it excellent for weight loss too. These are among the best foods for weight loss. Squash has the lowest amount of fat and sodium which makes it great for healthy arteries. Squash has large amounts of vitamin A, fiber, potassium, iron, and calcium. They are also very low in calories. The abundant amount of fiber in squash makes it suitable for suppressing appetite which in turn aid in weight loss. These have high amounts of carbohydrates in the form of starch and sugar. Sweat potatoes have high contents of fiber, water and have fewer calories. Sweet potatoes can aid in weight loss because of their rich fiber contents that produce a feeling of satiety in the stomach and reduces appetite. They are great to eat after an intense workout or physical activity to increase your energy levels. Oats are among the best healthy food you should be eating for weight loss. They are helpful in reducing heart disease, lowering cholesterol and hypertension. The regular consumption of oats can lower the risk of developing these complications. Oats have high amounts of soluble fiber called beta-glucan which are helpful for suppressing appetite. This fiber also prevents you from overeating but keeps you full for a long time. You may not need a need mid-day snack when you eat oatmeal for your breakfast. The fiber in oats can also lower cholesterol levels by reducing the absorption fats while removing excessive bile salts in the blood. These are great foods for weight loss because they have high amounts of water and are low in calories. They are good for detoxifying and cleansing the body due to their high content of fiber. Including beetroot in your diet can facilitate the removal of wastes and toxins from the body which can aid in weight loss. Beets can decrease harmful cholesterol levels in the blood by reducing the amounts absorbed. They have high levels of iron, potassium, and magnesium which play a role in preventing anemia, lowering blood pressure and building strong muscles. Eat them raw or make juices and smoothies from beetroot to get the most benefits. This fruit is a beneficial food for weight loss. It has low calories but has high amounts of a dietary fiber called pectin which found in its pulp. Its fiber makes it more filling and excellent for lowering cholesterol hence can prevent the accumulation of fat in the body tissues. Grapefruit juice can aid in cleansing and detoxifying the blood especially when drunk on an empty stomach. Drinking this juice can also boost your immune system due to its high contents of vitamin C.
These are a good source of lean proteins with fewer calories which is the reason why it is helpful in weight loss. Its thick flesh takes time to digest and is more satiating, therefore can keep you full for longer. Wild salmon can also promote the repair of muscles and tissues which can facilitate weight loss. Salmon has plenty of healthy omega three fatty acids which can improve your heart health and promote cell repair. These delicious nuts are helpful foods for weight loss. Though the almonds have plenty of fat, the fat has balanced monounsaturated and polyunsaturated fatty acids which can aid in weight loss. According to a study conducted by the Us National Library of Medicine, almonds can be effective at reducing weight. Almonds also have high amounts of proteins, antioxidants, calcium, and fiber which are helpful for lowering bad cholesterol. Eating plenty of almonds or its milk can aid in preventing the deposit of fats on artery walls. These superfoods for weight loss are an excellent source of dietary fiber, calcium, potassium and vitamin A, C but are very low in calories. Blueberries are sweet and fat-free which makes them significant for weight loss. They have high contents of antioxidants which can reduce the oxidative effects of free radicals and can aid in lowering cholesterol. Eating soups will unlikely make you overweight. Most have fewer calories which can aid in weight loss. A variety of most soups and broths contain at most 100 calories per serving hence they can be great for weight loss. Eating a small amount of low-calorie soup before the main meal can lower your chances of overindulging since soups can boost a feeling of satiety. These fruits have high amounts of Sugars and vitamin B complex. They have less protein and are fats free with significant amounts of minerals such as iron and potassium. The vitamins present in grapes converts the sugar present into energy. Grapes have powerful antioxidants which can aid in lowering bad cholesterol in the blood. When eaten in moderation, they can reduce weight. The red grapes have high amounts of phytonutrients on their skin which can lower the oxidative effects of free radicals. This type of Meat is high in protein but has fewer calories and low-fat content. Choosing preferably organic or lightly processed meats and limiting your servings can aid in weight loss. If you choose to eat meat, always try to rim any excess fat and remove any skin from poultry if it has some. Do not add butter or excessive oil to your meat during its preparation. Do not choose cooking methods such as trying to eliminate extra fat. This vegetable is a healthy and nutrient dense food for weight loss. It has high amounts of protein, water, and fiber but has zero fats which make zucchini essential for weight loss. Its high contents of water and fiber are helpful for suppressing appetite and keeping you fuller for longer. You can accelerate weight loss by including green leafy vegetables in your diet. Greens are great foods for weight loss because of their high fiber, water, and protein contents. They are also rich in specific vitamins and minerals which aid in boosting your immunity. Because leafy green vegetables are an excellent source of fiber, they can keep you fuller for longer. They are also great for detoxifying, cleansing the blood and making your skin glow. Add them to your smoothies or salads, stir -fry them or add them to your soups to get their abundant health benefits. Incorporate vegetables such as; kale, collards, water crest, spinach, mustard greens and arugula in your diet. Try to have a serving of green leafy vegetables as part of your meal. These great fruits have lots of healthy nutrients and insoluble fiber, pectin found in the peels. Pectin is responsible for cleansing the intestinal walls and removing wastes and toxins from our bodies. Apples help to regulate bowel movement, therefore eat them frequently to prevent constipation. Try to buy only organic apples if you can; they are chemicals and pesticides free. Apples are also rich in flavonoids which prevent the deposit of fat on artery walls causing blockage or narrowing. Including them in your diet enhances the steady flow of blood through the arteries and inhibits the formation of blood clots. These delicious fruits are excellent for weight loss. Not only are they low in calories but they also have high contents of dietary fiber. Therefore, eating them can result in a feeling of satiety and reduce the desire to continue eating. These fruits also contain large amounts of potassium, Vitamin Bs, antioxidants, and water which are convenient for boosting immunity. Their massive water levels make them great for metabolism and removal of toxins from the body. Potassium can help lower high blood pressure. This tea is an excellent food for weight loss. It is an excellent source of powerful antioxidants which are flavonoids and catechin. These compounds help fight free radicals and protect body cells and tissues from damage. In a scientific study, researchers discovered that antioxidant catechin is responsible for lowering body weight. Catechin may also influence the caffeine in green tea. It can boost metabolism and the oxidation of fats in the body. Try to drink moderate amounts of green tea to help you lose weight. These fruits are very nutritious and are great foods for weight loss. They have high amounts of antioxidants which are helpful at neutralizing the oxidative effects of free radicals. Strawberries have large contents of vitamin C and fiber. They lack fats and sodium but are an excellent source of potassium and manganese. The high components of fiber and low calorie in strawberries can stimulate metabolism and keep you full for longer. They are also low glycemic hence will not spike an increase in blood sugar. Add them to your smoothies, desserts, and shakes as often as you can for their health benefits. This whole grain is rich in protein, fiber, iron, manganese, riboflavin, and antioxidants. These nutrients help to regulate metabolism, suppress appetite and aid in weight loss. The high fiber contents in quinoa help lower cholesterol and control blood sugar. This property makes quinoa a great addition to the diet of diabetes. Quinoa is gluten-free and has all the nine essential amino acids needed by the body. Its high protein content makes it an excellent dietary substitute in most vegan diets. These fruits are great foods for weight loss. They have an abundant amount of fiber and carbohydrates which can support weight loss. Though they have high amounts of carbohydrates and sugar, these nutrients are low in the glycemic index. The sugars in bananas get absorbed slowly and do not cause a spike in blood sugar. Bananas help to regulate and control your metabolism and blood sugar which helps burn fat. Their high amounts of fiber help to keep you satiated too. Most dieters praise celery for being an excellent food for weight loss. Celery is a low-calorie food and has zero fat. You can eat a more substantial portion of celery without the fear of adding extra calories. It has high contents of water and fiber which makes it great for weight loss. Eating celery helps to fill your stomach faster and full for longer. This root is an excellent natural remedy to most ailments such as nausea, colds, coughs, and pain. These are as a result of ginger’s powerful antioxidant and phytochemicals. Ginger tea is used by many to aid in weight loss. It has a filling effect that helps suppress appetite and keep you full for longer. It boosts metabolism and increases fat absorption and burning which enhances weight loss. Several studies show that consuming ginger tea can lower cholesterol and high blood pressure. It can prevent blood clots from developing and causing heart attack and stroke. This citrus fruit is excellent for weight loss due to its zero calories and zero fat composition which are great for losing weight. The high amounts of vitamin C and flavonoids which are abundant on the peels and pulp of the lemon fruit have much fiber which can aid in burning fat. These compounds also help fight free radicals from damaging body cells. This summer refreshing fruit is excellent for weight loss. Its high content of water, fiber, and low-calorie volumes make it great for producing satiety and keeping you full for longer. Watermelon also helps to increase metabolism and aids in the removal of toxins from the blood due to its water abundance. These legumes are great foods for weight loss. They have abundant amounts of protein, vitamin B6, potassium, iron, and fiber. Lentils can be an excellent addition to your diet plan if your goal is to lose weight. They are low in the glycemic index hence cannot cause an increase in your blood sugar levels. They can lower appetite and keep you satisfied for longer. You may not need to crave for snacks after eating them with your meals. Their high fiber content helps boost metabolism and lower cholesterol levels in the blood. These have got high amounts of dietary fiber, vitamin C, folic acid, magnesium, and potassium. The fiber helps lower cholesterol and glucose in the blood. Artichoke has cynarine which increases the production of bile. Bile facilitates the cleansing and detoxification of the liver in addition to removing+ toxins and heavy metals from the body. It aids in metabolism and speeds up the digestion of fats which in turn helps in weight loss. This hot spice is one of the best foods for weight loss. It can help you lose weight if used consistently with your diet. It is believed that the compound capsaicin found in cayenne helps speed up metabolism, suppresses appetite and burns fat. A 2009 study found that consumption of capsinoid found in cayenne can increase fat burning and increase metabolism. Add cayenne to your foods to increase weight loss. This delicious fruit is full of vitamin, minerals, and fiber. Because of their high fiber content, you should eat them before a meal to increase satiety and prevent overeating. Try to eat the actual fruit in its fresh state and not when it is canned or juiced to get more fiber. Pineapples can also aid in the digestion of other foods which can help speed up metabolism. This heart-healthy food is good for weight loss. Green peas are rich in protein, vitamin C, potassium; iron and fiber yet are deficient in calories and have zero fat. Their high protein and fiber content help to slow down digestion and makes you feel full for longer. Green peas help suppress appetite and as a result, facilitate weight loss. Add them to other protein foods in your meals to increase satiety. These colorful peppers are delicious and are among the best foods that can be helpful for weight loss. They have large amounts of antioxidants, vitamin C, minerals and fiber which can help boost your immunity. Their high fiber content and fewer calories make them suitable for weight loss. Vitamins and antioxidants present in bell pepper can as well prevent cancer. These great vegetables can assist you to lose weight due to their high water, vitamins, minerals, fiber, and low-calorie contents. They are also low in the glycemic index. Therefore, tomatoes cannot cause an increase in your sugar levels. Tomatoes have significant amounts of water and fiber which help to increase satiety and keeps you full for longer. Eat tomatoes raw by adding them to your salads or make juices from them. These delicious vegetables are good foods for weight loss. They have considerable amounts of vitamins, potassium, manganese, folate, and fiber. Asparagus is also very low in calories which make them excellent for weight loss. The fiber and fewer calories in asparagus make them produce a filling effect in the stomach. They aid in appetite reduction and keep you full for longer. This whole grain has a significant amount of antioxidants, vitamins, minerals, and fiber which makes it excellent for weight loss. The high contents of soluble fiber in barley help lower cholesterol and prevent the deposit of fats on artery walls. It can fill the stomach faster and increase satiety. They also help lower cholesterol and blood sugar levels in the blood due to its low glycemic index level. Drink barley water or soup to aid in your weight loss journey. These fruits are very delicious and excellent for weight loss. Though sweat, plums are low in the glycemic index. They are also high in fiber that slows the absorption and digestion of sugar in them which in turn helps lower blood sugar. In addition to this, the fiber helps lower cholesterol levels. Plums have low calories and fat which can aid in weight loss. They are also rich in Vitamins and antioxidants which can boost immunity. The best foods for weight loss should come from natural sources that are high in fiber but low in the glycemic index and calories. These foods take time to digest, and they do not spike the insulin levels in your blood. Foods for weight loss should be high in protein but low in carbs. Proteins tend to slow digestion hence they help to keep you satiated for longer. When you are satisfied, you will unlikely crave for unhealthy foods. Proteins are also excellent for building muscles and repairing worn out tissues. As you lose weight, you lose both muscles and fat. The lost muscles need replacement and repair to aid in burning more calories. Proteins also assist in speeding up metabolism propels the body to burn more calories. Avoid processed, refined and sugary foods. These foods are high in the glycemic index and have empty calories. They increase your insulin levels and make you feel hungry most of the time. Eat a variety of whole, unrefined food sources instead. These best foods for weight loss can help you lose weight if you add them to your diet plan. Doing moderate exercise and including eating a healthy balanced diet in your regimen can help you lose and maintain a healthy weight.